Background: My 2012 Vespa 300 GTS bought new in 2013. Several months ago I installed front and rear Zelioni shocks purchased from SIP. I have examined and adjusted them extensively riding in an urban environment with semi-rough roads at speeds generally in the 0-55 mph region. In that context I am a very aggressive rider. For higher speeds I prefer my car or my Ducati. 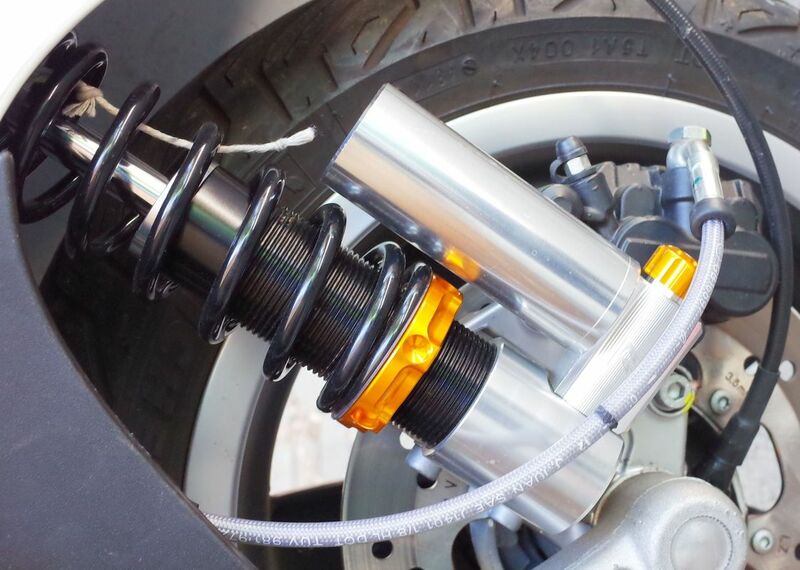 Summary Opinion: As a 165 lb rider I find the Zelioni front shock to be too stiff in spite of its advertised adjustability, but the rear shocks are ideal. The construction quality and smoothness of the product is absolutely top notch. Zelioni itself does not respond to my communications. The SIP representative said that in their experience the product was perfect, that I should consult a suspension tuner, and to please refrain from asking them more than one question about an issue. According to SIP, there are no optional springs with lower rates than what is provided (90lbs/in). My Setup: Regarding the rear shocks they are awesome. At my weight I seem to be in the mid-range of the adjustments. I can make them super plush or stiff. Super sweet! Currently I have them set a bit stiffer than I would like, in order to try to match the stiff front shock. Regarding the front shock I have the spring preloaded 5.5 turns (from the bottom collar) which I consider minimum preload since it is very near completely unloading the spring at "free sag". At this setting I can rotate the spring freely with very little effort. This setting gives about 28% "rider sag" which is a minimum recommended in my internet searches, although opinions on this may vary. Additionally, I have measured that the stock 2012 Vespa GTS 300 shock is less stiff than the Zelioni set at its minimal values. The stock Vespa shock actually felt smoother in normal driving situations, even though its action is not nearly as smooth. Feedback Requested: I am currently searching for a softer spring to fix the Zelioni for my needs. It is not easy to find. I am curious what Malossi and Bitubo owners have experienced. As I mentioned my Zelioni shock spring is rated at 90lb/in, and this is relative to the rear combined 104-140lb/in (which takes most of the engine and rider weight). Can anyone tell me the spring rate of these alternate front shocks? i use bitubo front and rear on my viet GTS 150.
to my liking bitubo handle the road and corner pretty well. stock seting at the rear and 2 click from hard at the front. but still looking for the best set up. i'm up for proper set up good balance with bike weight and rider weight. any input how to do it? I have had a Bitubo shock on the font of my GTS250 since I got it. A week ago I had a ride on a friends new GTS300, and was amazed to discover what a difference my Bitubo was making. My scooter hugs the road, is very steady and smooth, while the handlebars of the GTS300 were bouncing all over the place. I have also fitted polyurethane bushes to the rear suspension, giving steadier handling through the bends, and would love to fit a pair of Malosssi rear shocks as well. My old PX200 had Bitubos front and rear, as well as polyurethane bushes, and rode like it was on rails. Best handling scooter I have ever had in 55 years of scootering, although my GTS comes a very close second. Can't comment on Zelioni, but their products certainly are beautiful. There are a lot of sources on the web. Racetech has a great reputation and provides a lot of information here. Taking the measurements there way is most accurate albeit a PIA. I have a Vespa 300 GTS Super Sport. It actually gave a good ride stock. It was kind of soft but I never experienced the slightest tendency to high speed wobble in corners so it did a reasonable job. 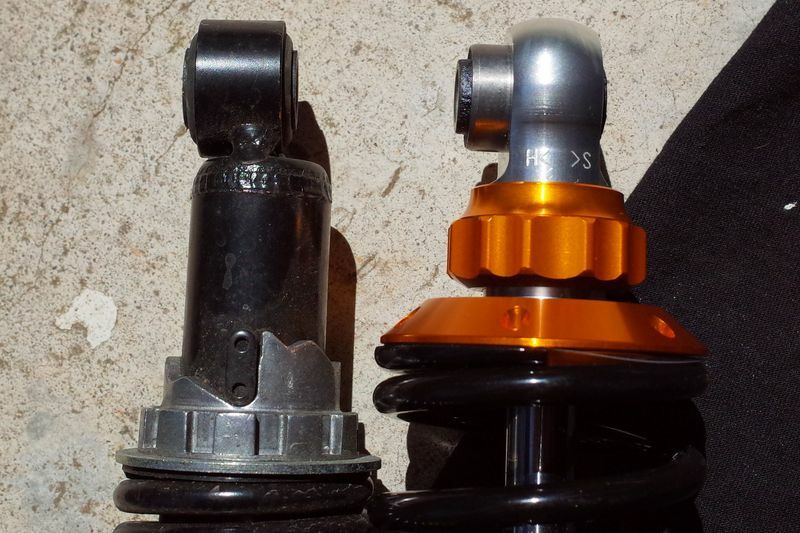 That said the stock shocks do not provide smooth damping and are basically cheap for Vespa profits. My current setup on my front Zellioni is moving the lower screw collar up 5.5 turns from the bottom. This is giving me roughly 28% rider sag, which appears to be the suggested minimum according to Racetech (although they do not comment on Vespa which does not have motobike forks). My compression damping is at the lowest setting, click 1, and the rebound damping is at click 8. This seems to give me a very good sporting ride. 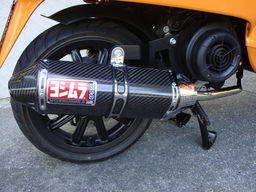 My only complaint is that Zelioni seems to have made a one size fits all choice on the spring rate and possibly the dampening range that seems more optimal for a much heavier rider, perhaps the proverbial fat American. Although as I said the rear shocks feel perfect to me and offer a wide range of fine tuning for my weight. I find it really useful to put a small zip tie around the shock plugger with a string attached to it that allows you to readily pull it back for testing shock movements. My current set up allows travel up to and just shy of the bumper on a 35-40mph non agressive drive over the somewhat bumpy roads I drive. If I go out and push it hard and take on big bumps headon the travel goes up enough to push and lodge the zip tie into the bumper. This way I figure I am making good use of the shock travel. I installed the polyurethane bushings from Jettin on my Vespa GTS300 Supersport as well. Its a very worthwhile change IMO. Better performance and with my new shocks it still adsorbs the bumps much better than stock. My Zelioni rear shocks are perfect IMO. I think most people can really dial them in however they want. It is easy to adjust the spring preload from under the seat, and the rebound damping from the bottom. I would bet they would work great for you. Do you know the spring rate on your Bitubo front shock??? The Zelionis have it printed on the spring. The rear Zelioni springs are progressive (52-70lb/in each), and the front is 90lb/in. While that suggests the front spring is linear the coils are not completely evenly spaced suggesting it may have some progressive character? The stock setup was highly progressive. I was thinking the Zelioni shocks were adjustable for compression and rebound along with a threaded body? If so, have you attempted to adjust the compression speed on your front along with the rebound setting? Is the bike's front pushing at turn in or are you dissatisfied that it doesn't ride like a Cadillac? BTW, the black rubber doughnut around your front brake line is supposed to be up next to the shock body to keep the brake line from wearing through where it touches. Slide it up, mark where it needs to be, put a dab of silicone and slide it in place and allow to dry. First let me correct an error in my first post. 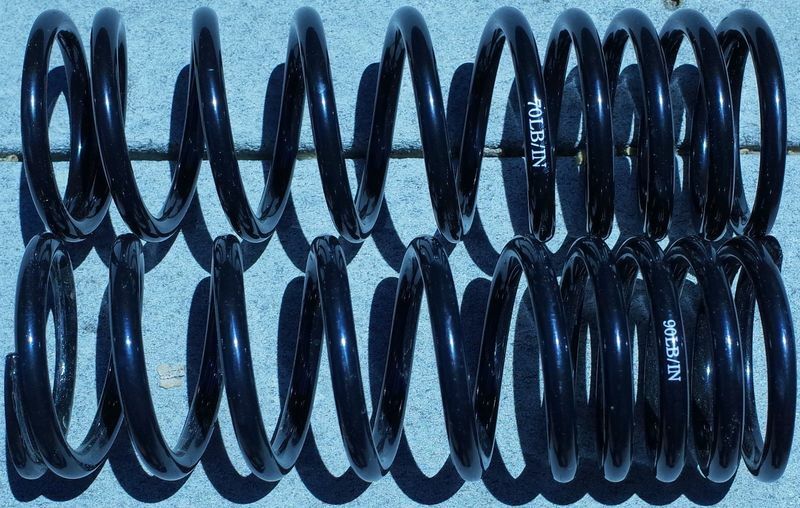 I have reduced the spring preload about as much as I dare as the spring can be rotated very easily when the shock is completely unloaded as opposed to under "free sag" (i.e under the Vespa's own rider free weight). I have the compression damping at the lowest setting in order to make the overly stiff front end a little more compliant. With fully adjustable compression and rebound damping I was looking for the Zelioni to adapt to my riding conditions which can range from very sporting to tuning for a more comfortable yet still good handling setup. I also expected it to match the rear suspension. IMO it fails those 2 conditions due to an overly stiff front spring rate. This may be due to it having a less progressive spring or excessive compression damping. I believe it is the former. I love the build quality of this suspension and am hoping to locate a softer/more progressive spring to improve it for my conditions. Back in the day many people's idea of a good shock for sport applications was to make it really stiff compared to the stock pogo stick suspension. Today, I think most people understand that the best setup for traveling fast on rougher roads requires a more compliant setup than one optimized for an ultra smooth race track. My bottom line is I can go faster on the roads I drive with a more compliant front end. If your wheel is getting kicked up in the air by bumps it adversely impacts cornering traction. Regarding my brake cable it does not rub anywhere since I removed the upper cable mount. Thought I would update my experience after putting about 1500 miles on my Zelioni shocks. As before I would say the rear shocks are perfect. The cats meow. I can adjust them to accommodate any kind of ride I want. The front shock has improved slightly by softening up a little bit. However it is still way too stiff on the compression side and gives a harsh ride unless you are hitting bumps at about 60mph and weigh more than 160lbs and have the shock at its softest settings. I continue to think that someone designed the front shock with motorcycle parameters in mind. However, a Vespa is not a motorcycle and has much much less weight on the front wheel. That is my opinion as to why the Zelioni front shock is not compliant with the road. The one bit I have changed my mind about is the cause of the problem. I now think that it is mostly overly strong compression damping that is most at fault. I will also state that there is no way in hell anyone will get any service from Zelioni. They are completely on an island somewhere and unresponsive to any customer concern. Is there anyone out there with a Maloosi front shock that can comment on whether they experience it better with regards to their front shock? Did you try a softer spring yet? Should fix your issue. Recently did a Bitubo install on mine, way too stiff at rear even with 200# rider. Swapped out the spring for softer one off the factory shock. Fixed. I like it alot, it's soft enough to set to an equal spring pre load compared to the stock shock. I have the preload set to where the spring goes "down" like a few cm when I go sit on it. The damper setting is like way to much, you can rotate the knob like 3 times full 360 degrees, with like 10 clicks on every rotation, giving yuou like 30 diferent settings.. I put that on 5 clicks from the maximum damping. For me it's perfect, a good mix between sport and comfort, I ride alot with a duo on the back and that makes the front a bit light weighted but even then the handling is perfect. And when I put the hammer down it handles like a sportbike.. Awesome to get some feedback guys! Currently, I have bumped up my spring preload to about 12 turns which gives me just 5mm of rider sag. Under my conditions I think this is better. Preload, counter-intuitively does not increase the spring rate but allows for more impact travel and is OK IMO as long as you have some measurable sag. Since the front travel of the Vespa is quite small I opted for this solution. To further ameliorate the overly stiff front end I have lowered the front tire pressure to 15psi cold (absolutely not recommended to anyone riding near the edge) and increased the rear tire pressure to 35psi. With all this done it is better balanced but remains so sporting that it is uncomfortable below 50 mph. That is not exactly a formula for success for the average Vespa rider. I think I may be OK with the Zelioni if I can have the damper fluid in the shock changed out to something about 50% lower in viscosity. Problem is no one but an ever silent Zelioni knows what they put in there. But I may just do it and take a cps reading of sorts and replace it with the thinnest stuff available. If anyone has any ideas or shock guys that can help with this I am listening. With the current set up if I ramp up the damping to the max value it feels like a rock and would even give sore asses to couple 250 pounders paired up for a ride. It is seriously ridiculous! Bommes, thanks for the feedback. That is what I have been needing for some time now. Maybe I should just remove my Zelioni and replace it with the tried and true Malossi up front. Just to be clear you are finding that it gives an ideal ride for you at an intermediate setting such that you can adjust the ride up or down to meet you needs? I am about 165 lbs. Can I ask what your weight is? We use the metric system (like most of the world.. ) so my weight in kilo's is 85kg with all the gear. Same for the misses when she rides along on the duo seat. 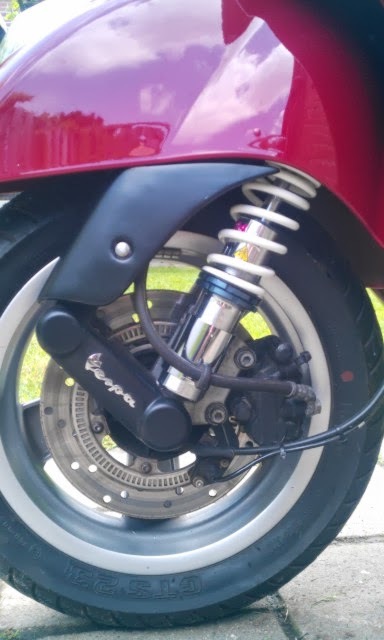 I think the spring on the malossi shock is almost the same as the stock one on the GTS. With the extra option to adjust the preload and a much more advanced damper/shock. I am pleased with it, although I have seen story's (here on this forum) abouth bad build quality in some cases. For me: if I can find the spare cash I would change the rear to a pair of malossi right away. Bommes, I am close to 80kg with all the gear, so not too different. Like I mentioned before my spring rate is labeled as 90lbs/inch. Does your Malossi give its spring rate by any chance? Bluecloud, Thanks for the link, that one is better than what I have seen before. The ID and OD of the Zelioni spring are 1mm greater than stock by my measurements (42mm (1.63") and 57mm respectively). The Zelioni spring is much shorter at 175mm unloaded. So at a touch under 7" it is shorter than anything on that site, although an 8" (203mm) spring may be fine or better at a lesser spring rate. At this stage I think the issue is more about too much damping, but a lower rate spring as you suggest may be a simpler solution. I took a closer look at the stock Vespa 300 GTS front shock spring today. I took 7 measurements with weights up to 40lb to extrapolate the stiffness number. I had understood from hearsay that the first 10% of a spring's movement is not linear. However the measurements made look linear so I am comfortable with the above extrapolation. I am extremely interested in determining the Malossi spring rate! If it appears to be a better fit for me perhaps I can swap it into my Zelioni or eBay my shock and get a Malossi to replace it. Whatever! Talking to a Works Performance rep, the only reasonable sounding substitute spring they sell in this case is the 8" and 80lbs/inch spring, which has a slightly larger inside and outside diameter. That might be an improvement in my case. Perhaps I can buy this, or one of the Malossi RS24 springs instead. Anybody know the length and ID/length of these Malossi springs? I have recently gotten in touch with Zelioni and they seem very responsive. Contrary to what SIP told me they do offer 2 other springs at 65 and 70lbs/inch (vs 90lb/inch USA stock) that from my understanding are used in Asia (rougher roads/lighter riders?). I have asked them to sell me the 70lb spring and am hopeful that will make the Zelioni system perfect for me. I have also asked their representative if I can make such custom ordering information available here. So stayed tuned if you are interested. This could end up being really sweet. 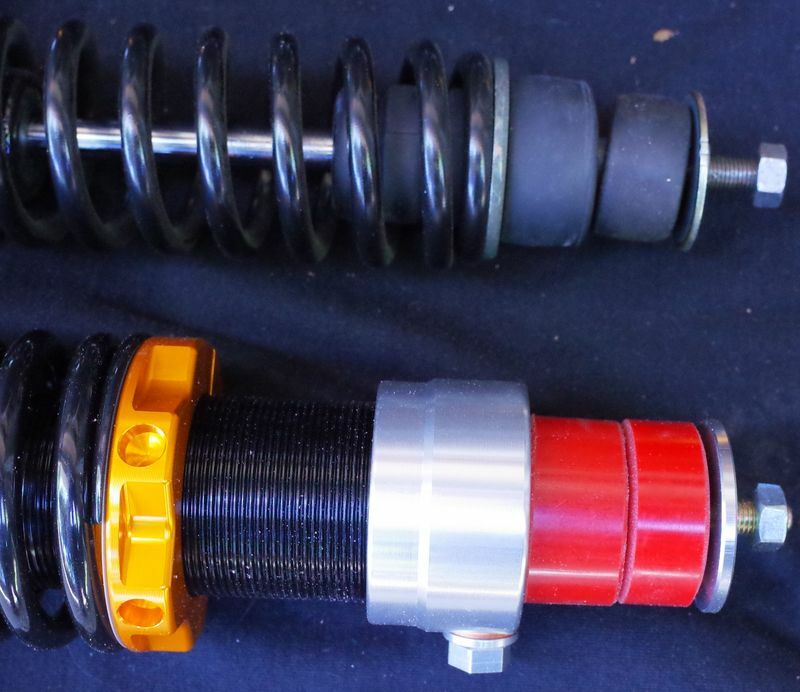 I mentioned before that the Malossi RS24 "Racer" shock has a 1,4k (78lb/in) spring rate. However, I also inquired of the USA Malossi dealer Scooterparts.com about the standard RS24 spring rate, and they told me it was 1,6k (90lb/in), the same as my Zelioni. This makes some sense as the "Racer" shock has compression damping adjustment. So you can view it as the lighter spring allows adjustment of the compression damping. It becomes more adjustable in a way. At any rate, most all these manufacturers with the exception of pricey Ohlins, makes a one size fits all shock adsorber. So everyone of them must make massive compromises that fit some people better than others. Unfortunately, there is no consistent established way for a consumer to figure out what is best for them. All the companies and all the retailers simply tell you the shock is great and do little or nothing to actually fit their customers to a best for them shock. OK, end of my most recent rant. Stay tuned for Zelioni front shock version 2! Have popcorn... awaiting riding impressions! Sorry for the delay, it took me more time to do my setup than expected. I am a reasonably happy camper now! Upon first installing the spring and making a non-measured increased preload adjustment my first impression quick ride was that the change was small. But after my measurements showed nearly no rider sag I reduced the preload and it started feeling alot better. The harsh edge was taken off the bumps. The lower spring rate now allows me to easily feel the differences in my various adjustments. Before the overly hard spring covered them up and it was difficult to arrive at good decision as it sucked everywhere. I am currently adjusted to 8mm of rider sag, the lowest compression damping at click #1, and the rebound damping at click 6-8 of the 20 clicks available. The ride is near an optimum for me. It is sporty without being harsh and the tire compliance with the road is better at sub 50-60mph speeds I usually Vespa ride. All that said I still suspect that I am at the extreme end of the compression damping adjust scale, which was part of what I was hoping to be able to modulate in my high end shock purchase. I have not messed with the compression damping yet as it seems illogical that it would be helpful given all my results. Regardless, I will give it a try soon. But I think any future need I feel to further lower the spring rate and compensate with compression damping can now be easily accomplished by adjusting the nitrogen pressure in the shock. As I mentioned there is an effective 27.5 lb spring rate added there. From my understanding the typical 250 lb/sq inch pressure in these shocks can reasonably be adjusted down to 100 lb/sq inch. Being an OCD tinkerer I have asked Zelioni for a schematic of the shock or information about how to adjust the nitrogen pressure in their shock. Unfortunately, after a couple requests I have yet to hear anything back. I will further comment on Zelioni support after giving them some more time. I think it is important to have a responsive company for these kinds of purchases as they will eventually need support in terms of parts and specifications when repairs are needed. I am not yet convinced that bit is well covered, but I have my fingers crossed. That's great news bcc! Congrats! Given I have about 100 pounds on you, I think I'll stick with the stock spring for the front end. Grateful that you shared your experiences with us. Yeah, I think that would work well for you! I should also point out I never ride double but that would tend to stress the rear shock more anyway. How about sharing your settings and general observations? One other bit I should share. While the shock was apart I did some measurements on the rebound damping. Contrary, to what I mentioned before the compression and rebound damping appear to be 100% separate. I made measurements of the time it took for the shock to rebound under the nitrogen gas pressure to get a feel for the settings. Basically, at the lightest settings of click 1-3 it would rebound in about 1.7 seconds, by click 5 it was 3.1 seconds and it progressively rose to about 3.8 seconds at click 17, then it started kicking in faster with 4.2 seconds at click 18, 6 seconds at click 19, and finally a full 15 seconds at click 20. Currently, I am click 6-8 and find that suits me well so there is a lot of fine adjustment around that region. Just watch it at the very ends where the change is abrupt. As I said putting on full compression damping, which made it tough to compress for the test had no effect, at least on the mid rebound damping measured so scratch my early post suggesting they crosstalked a bit. As soon as the trigger is pulled and they are installed, I shall share. I've replaced the stock suspension on 2 of my last 3 bikes. Makes a dramatic difference. In short, it feels like a completely different bike. The third came with a full works suspension from the factory, so that was just twiddling knobs to dial it in. Cool! I agree shocks make the difference and are usually the best upgrade. I'll look forward to your thoughts. I think you will have to run a lot of preload on the rear shocks as they seem set up lighter. I have one little trick for you that I have discovered for setting your Zelioni front rider sag accurately and easily. I put the new spring on with the wider spaced coils facing upward. This enables you to get your fingers in there and slide the rubber bumper down to the base. Mine, at least after some use is fairly loose (if not add a bit of oil) and slides more easily than a zip tie. At any rate do this without sitting on the bike and then sit on the bike and balance yourself feet off the ground in your standard riding position. Then get off and measure how much the rubber bumper has moved up. Instant unassisted rider sag measurement! Maybe start out with the same 8mm I have currently settled upon and work from there. I found when I had less sag, like 4mm the shock would be fine on some bumps but on others would be a bit harsh. This is likely due to different front wheel loadings that occur during the ride such that some of the time the preload is topped out and you end up adsorbing that bit in the bump. I have one little trick for you that I have discovered for setting your Zelioni front rider sag accurately and easily. I put the new spring on with the wider spaced coils facing upward. This enables you to get your fingers in there and slide the rubber bumper down to the base. Mine, at least after some use is fairly loose (if not add a bit of oil) and slides more easily than a zip tie. At any rate do this without sitting on the bike and then sit on the bike and balance yourself feet off the ground fin your standard riding position. Then get off and measure how much the rubber bumper has moved up. Instant unassisted rider sag measurement! Maybe start out with the same 8mm I have currently settled upon and work from there. I found when I had less sag, like 4mm the shock would be fine on some bumps but on others would be a bit harsh. This is likely due to different front wheel loadings that occur during the ride such that some of the time the preload is topped out and you end up adsorbing that bit in the bump. It will be great to have another Zelioni owner join the discussion. The other bit about the setting the spring open at the top is that it helps using zip ties for assessing full travel. Part of my routine now is to hit a big bump hard at high speed such that I think it should have given me full travel. IMO, under those conditions you should start to see the zip tie lodging well into the rubber bumper. Being able to pull down the bumper makes that determination easier. the read up on SIP for the Malossi RS24 says that you need a steering column conversion. What's all this ? Can't you just 'plug and play' ? Don't think anything special is needed. My shocks were plug and play. on SIP the selling details for the Malossi RS24 - at bottom of description there is the statement about steering column. Also, of all the models it says this shock fits - doesn't list GTS300 !!!! Call/email SIP and they will give you the scoop. SIP is not allowed to sell many Malossi parts to the U.S. market. Malossi Shocks tough to find here. Only thing I see is http://www.scooterwest.com/items/?_pageCCS=t#page=/item_details/Malossi-Paoli-RS24-Front-Shock-GT-GTS-Super-300/3673 which suggests you can mount this model. But I think there are different versions of the RS24. Just a quick update. I have started to test the compression damping adjustment (front shock), and am pleasantly surprised that it provides a nice progressive increase in the shocks resistance to bumps. I have gone all the way up to the maximum damping, to setting "10", and while it becomes much stiffer it is not totally out of control. My rough guess is that the 65lb spring would be best and allow for optimal compression damping adjustment in my case, but I can do my thing by adjusting the nitrogen pressure instead. Currently, with the 70lb/inch spring, I find the lowest compression damping setting to be best for me (160lbs). Everyone is different, but I would recommend something like getting the 65 lb/inch spring for those under 180 lbs, the 70lb/inch spring for those 180-200 lbs and the 90lb/inch spring for those over 200 lbs +. If one follows this recommendation I think you will at least get on the map and be able to identify what will work optimally for your riding style. After all is said and done I think that the Zelioni can deliver great suspension for your Vespa, but like most things in life you need to measure it properly for yourself. The thought that you can just buy it at your local shop and be happy with the result is foolhardy. One's weight and riding style matter immensely. I am proof of that surely. Thanks for this write up and I think I may be ordering one as my RS24 seems much too soft. For the life of me I cannot find the difference between the "black edition" and the regular one. Would you know? Never seen the Black Edition before. The word Edition and the near identical specs suggest the internals may be the same, but they certainly have redesigned the exterior. Sorry I can't help. Please post here if you are able to learn anything. Also try the link to the Zelioni rep I posted. Perhaps he can answer the question for you. Let us know what spring rate they provide on the front. I am curious if they have changed the default. IMO the 70lb spring would work best for you. Received the Z and installed it w/o issues and I can sincerely say "wow!" This is way better than the Malossi and not too stiff as some have reported. I only have about 20 miles on it but my scoot finally feels like it should. The rebound is a bit ridiculous as I adjusted it all the way stiff for fun and the shock takes 20 seconds to bounce back. Highly recommended and there happens to be a slightly used RS24 on ebay right now for some reason..
Hi Jeff, long time since I have been on the forum. As I recall all my Z springs were labeled with their spring rate. 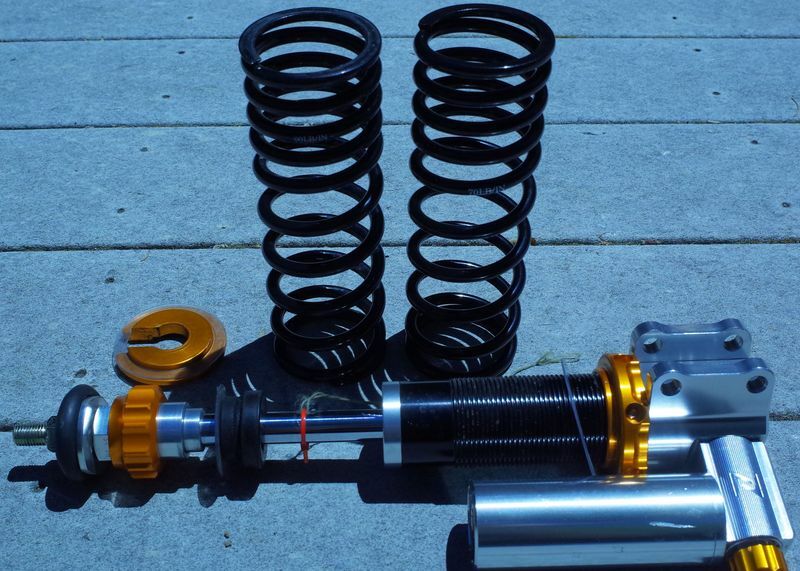 At 195lbs you say your shocks are really nice but do not say what spring rate you received. I continue to be happy with my 70lb springs at my 160lb weight. Can you check the label on you spring and give us that critical bit of info? Hi there, after riding the front and paying more attention it is a bit harsh. It's 90lbs. The rears however are great. Zelioni rear shocks not fitting? So I have a shop trying to put in the rear shocks for me, and they are having some trouble. Apparently the one just will not fit. The hole for the bolt is too small or something. it is definitely a different size hole from what is in there. It is going into a vespa GTV, so it is supposed to fit for sure. I did not get any new bolts or bushings though. Anything I need to know to get them to fit?